Denmark host Republic of Ireland in the first leg of what promises to be a nerve-shredding World Cup qualification play-off in Copenhagen on Saturday. This article contains our Denmark vs Ireland betting preview including predictions, betting tips, probable lineups, team news, enhanced odds, bookmakers offers and no deposit free bets on this fixture! 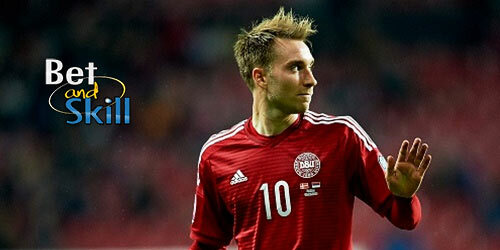 Denmark snatched a play-off place with a 1-1 against Romania in their last outing. They overcame a slow start to their qualifying campaign and finished in second place, despite tasting defeat against Poland and Montenegro in their opening three matches. The Danes conceded only eight goals during their qualifying campaign and are unbeaten in their last ten matches in all competitions, a sequence of results that includes a fantastic 4-0 thumping of Group E winners Poland. Plus, Age Hareide’s side boast an impressive home record, having been beaten in just one of their last 10 matches on home turf. The Danes have no injury concerns surrounding their key men and manager Hareide is not expected to make wholesale changes. Christian Eriksen, who has scored 8 goals in qualifying - including six in his last six games - will play as number ten behind the lone striker Nicklas Bendtner and with Pione Sisto and Yussuf Poulsen on his flanks. Nicola Jorgensen and Andreas Cornelius are the back up options upfront .Thomas Delaney may get the nod ahead of Lasse Schone and partner William Kvistin the middle of the park. Simon Kjaer and Andreas Christensen should start at the heart of the back while Jonas Knudsen and Peter Ankersen should be the left and right back. A 2-0 win over Moldova in their penultimate fixture set up a winner-takes-all showdown in Wales on the final qualifying match, and a second-half goal from James McClean was enough to secure a 1-0 victory over the Dragons and earn a play-off chance. They were unbeaten in their five World Cup qualifiers away from home, also winning in Austria and Moldova and collecting 11 points from a possible 15. Furthermore, the Boys in Green have scored in each of their last nine away internationals, stretching back to November 2014. Eight of their 12 qualifying goals came on the road. Jeff Hendrick has handed Ireland a major boost ahead of this clash as he was able to train with the rest of his team-mates on Thursday. His club-mate Stephen Ward also looks recovered, meaning that the only missing player are David Meyler through suspension and James McCarthy with a hamstring problem. Glenn Whelan should anchor the midfield as a result, with Conor Hourihane and Harry Arter next to him. Daryl Murphy is expected to lead the line in a 4-5-1 formation, while Shane Long should play at stome stage. "Denmark vs Ireland betting tips, predictions, lineups and free bets (World Cup play-off 1st leg - 11.11.2017)"